We strive for diversity among both our employees and our customers. Milwaukee is an amazing city, but one with a lack of spaces which are frequented by different cultures, genders, races, ages, and national origins. Bounce Milwaukee is one of those spaces, and we work to ensure that people can meet, share and play together in an environment of mutual respect and understanding. We are proud to be a Sanctuary Restaurant, and do not allow the harassment of any individual based on immigrant/refugee status, race, religion or sexual orientation. We ensure that every person in our building - customers and employees - is treated with respect and as an individual. In line with this respect is our belief that every employee should be able to support themselves with a 40-hour work week. We are committed to paying every employee a living wage, and providing as many benefits as we are able to, including education. Bounce Milwaukee publicly supports a higher federal minimum wage, which will benefit both our customers and employees, and supports legislation to assist employers in rejecting the sub-minimum wage (currently $2.33 in Wisconsin) in favor of a full minimum wage for tipped employees. Our (amazing!) employees are responsible for our success, and we believe that all employees should share in our success. We provide bonuses to every employee based on their hours worked, and we are committed to doing so whenever it is feasible to do so. We also reject the traditional franchise model of expansion, which favors those who already have an excess of capital, in favor of progressive employee ownership for developing new locations. We welcome investment in these new locations only when investors defer to existing employees and embrace these values. We strive to improve our community both through direct giving and by helping our employees to realize their own potentials as active members of the community. In addition to educational opportunities, Bounce Milwaukee seeks to boost our employees' awareness of community, and to allow our employees the autonomy to use company resources to effect positive change. We believe in supporting our employees in and out of the workplace, offering them opportunities for growth and self-improvement through education and community interaction, and going above and beyond when they need additional time, resources or support to adapt to major life events or adversity. Play is vital to our growth as both children and adults, individuals and groups. We seek to facilitate play for all ages, and across generational and cultural lines, though open-ended fun, facilitated activities and teambuilding. We are also committed to making our workplace a fun one, and doing everything we can to ensure that our employees love coming to Bounce Milwaukee (nearly) as much as our customers. We are committed to conserving and preserving energy and other resources and minimizing our impact on the environment. To that end, we recycle, source our products locally whenever possible, and have implemented "smart" technology throughout much of our building. You can get a Bicycle Benefits sticker here, too, and get a free drink when you pedal to play. If you visit us in a plug-in electric vehicle, we'll provide you free valet parking and charging! 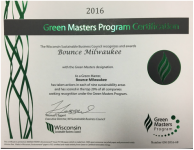 We participate annually in the Wisconsin Sustainable Business Council's Green Masters program (and were honored to be named a Green Master in 2016, 2017 and 2018! ), and are a participant in the Department of Energy's Workplace Charging Challenge. Much of our building is "smart", so that activities and spaces only consume power when customers are present. All of our delivered food comes to you in fully electric vehicles, too! ​We meet nearly 40% of our energy needs with our own solar array, which means that pizza we bring you will have been both baked and delivered with sustainable energy. We compost, too! We keep our kitchen food waste (and, soon, post-consumer waste) as far from landfills as we can.